“It’s true that vaccinations stop the epidemic from spreading, but without emergency medical treatment for patients with meningitis, the number of lives lost would be catastrophic," says MSF doctor Nico Heijenberg. This young girl has been brought nine miles to get treatment for meningitis in Yékoua, Magaria district. A meningitis epidemic that began in the Zinder region of Niger late last year shows signs of easing, but the number of people affected remains high. Left untreated, meningitis is fatal in more than half of cases. In the Magaria district in southern Niger, where Médecins Sans Frontières (MSF) has just begun vaccinating more than 500,000 people, its mobile medical teams are ensuring that patients receive medication promptly. MSF’s Claude Mahoudeau describes the teams’ work. Although treatment draws less attention than vaccinating, it is critical to the effort. In Yékoua village, near Magaria, MSF’s logistics team has just cleaned two rooms near the village health center, preparing them for possible patient visits, when the nurse, Madame Souéba, approaches: “A patient just arrived and I treated him,” she tells us. “That’s the second case of meningitis this morning. Luckily, we received the new drug–ceftriaxone. It is very effective. I'm so relieved to be able to give it to my patients. We later learn that the village of Toubé does not have supplies of the meningitis drugs that MSF distributes. It has no health center, which is a prerequisite for administering these injectable medications. In the rural areas, villagers must often walk more than three miles to find a clinic, which limits access to proper care for many. Fortunately, villagers organized immediately to bring the sick child here. Her father had left the village to work in Nigeria. 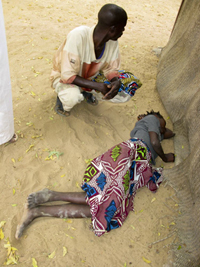 People in this area are very familiar with chankarow–the Hausa word for meningitis–which means someone who cannot move his head. The symptom is unmistakable. A few days earlier, one of the two MSF teams providing medical care had passed through Yékoua, a village at least an hour west of Magaria, the district’s main town, to collect information on those receiving treatment and deliver medication. Many people are now ill. Madame Souéba would like the MSF team and its traveling doctor to return, as soon as possible. The logistics team promises to pass on the information that evening in Magaria. With a little luck, one of the two teams sharing responsibility for monitoring the district’s 14 health centers may have planned to visit the area west of Magaria. At this point, Madame Souéba does not think that any of her young patients need to be referred to the Magaria hospital. The sun was low by the time we left Yékoua. It takes us half an hour to find the village, but when we do, the village chief welcomes the MSF team. The team visits the girl’s mother, who has stayed at home with her seven other children. No one else shows signs of illness. The team moves quickly and gets back on the road. Its day has barely begun. Team members plan to check in on four health centers today. That’s not counting any unplanned stops in isolated villages to search for meningitis cases. In Yékoua, a line of people waiting to be vaccinated has formed under the acacia trees. At the health center, Madame Souéba is pleased. She has received new medications and knows she can count on MSF’s Dr. Simon.